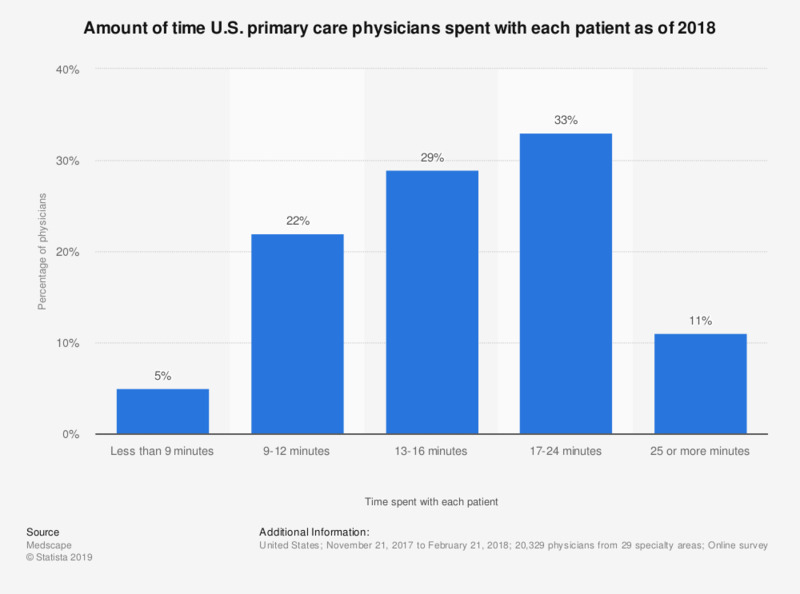 About 33 percent of U.S. physicians spent 17-24 minutes with their patients, according to a survey conducted in 2018. Physicians are often constrained in their time directly working with patients, which could have an impact on patient care outcomes. Studies found out that physicians spend almost half of their time in office on data entry and other desk work. More sophisticated, network-enabled EHR (electronic health records) systems for physicians could probably be a step towards more time directly with patients. Physicians work in a variety of fields and across direct patient care and research. Within the last 50 years, the total number of active physicians has increased dramatically throughout the United States. Among all U.S. states, including the District of Columbia, the District of Columbia had the highest rate of all U.S. states of active physicians. In a recent study, physicians were asked about the time they spend with their patients. According to the results, a majority of physicians said that they felt their time with patients was limited. In 2018, most physicians saw 11-20 patients per day. Some reports have estimated that for every hour of direct patient contact, physicians spend an additional 2 hours working on reporting and desk work. Recent physician surveys have also indicated that one of the primary reasons for physician burn-out is having too many bureaucratic tasks.